Large Trees Transported to Private Property Owner for Landscaping by Big Trees Inc.
SEATTLE, WA: Big Trees Inc., (http://bigtreesupply.com/), a tree nursery and tree transplanting company in the Seattle area, recently undertook an unusual project which involves barging in trees to a lakeside property. Due to limited access for the large trees requested for the project, a barge and crane were obtained for purposes of transporting the trees to the property. The company has now obtained all necessary equipment and the project will commence shortly. The project involves a large number of big trees, including some 600 pound flowering Cherry trees, some Dogwood trees and numerous 12’ tall Arborvitaes for a total of 16 trees. In addition to the trees, several large soil and gravel sacks will be brought in as well for other aspects of the landscaping. The materials will be loaded in from the lakeside of the property by a barge and crane combination, which will be used to reach out and put the trees on the pool-side patio. 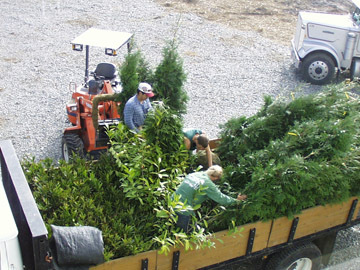 The trees will then be brought to their respective locations for the landscaping project.